Great Beginnings … Lead to Great Finishes is the motto of Blue Buoy Swim School. Each student is given the foundational development and the opportunity to reach their full potential as a swimmer. That potential could be a lifetime love and enjoyment of the water, becoming a teacher or coach helping others learn or even participating in one of the highest levels of elite swimming, the Olympic Games. We are proud to have eight of our former students who have reached this pinnacle and two others who have held World Records. If you would like to be added to our Student Hall of Fame page, please complete the Join Blue Buoy Student Hall of Fame form below. Amy White Baladis swam the 200M Backstroke in the 1984 Los Angeles Olympics winning a Silver Medal. Amy competed in high school at University H.S. in Irvine and collegiately at Southern Methodist University in Dallas, TX. She later enrolled her daughter Alexus in lessons at Blue Buoy joining a long list of second generation students. Another second generation student, Gavin Arroyo learned at Blue Buoy as a tentative four year old son of Judy Baxter Arroyo who was a national level swimmer in the early 1960’s at Blue Buoy. Gavin was an All-American Swimmer & Water Polo player in high school and at U.C. Berkeley winning NCAA titles in water polo. He was a standout member of the U.S. Olympic Water Polo Team competing in the 1996 Atlanta & 2000 Sydney, Australia Olympic Games. He is the Men’s Water Polo coach at California State University at Long Beach. Jason Lezak learned at Blue Buoy as a three year old and continued with summer brush up lessons until age twelve. An All American high school swimmer and water polo player at Irvine H.S. he followed Gavin Arroyo as a CIF Champion in the 100Yd Freestyle and enjoyed an impressive NCAA career at U.C. Santa Barbara. Jason is a three time Olympian having competed in the 2000 Sydney, Australia, 2 004 Athens, Greece & 2008 Beijing, China Olympic Games. He is a multiple medal winner and is best known for his amazing relay swim in 2008 where he staged a come from behind victory for the USA in the 400M Freestyle Relay with the fastest relay split in history. His swim is one of the favorites to be selected as the greatest Olympic moment. Jason now has two sons, Ryan, Blake and daughter Layla that are students at Blue Buoy. Michael ( Milrod) Cavic learned at Blue Buoy before joining local club teams and set National H.S. records in the 50 Yd. Freestyle and was a CIF Champion in backstroke, butterfly as well as freestyle events. He swam for U.C. Berkeley and represented Serbia in the 2000 Sydney, 2004 Athens, 2008 Beijing Olympic Games & 2012 London Games. He is best remembered for his incredible 100M Butterfly race with Michael Phelps in Beijing where he was out-touched by one one/hundredth of a second for the Gold Medal. Ryan Brown learned to swim at Blue Buoy and used his foundation to become an All American water polo player at Foothill H.S. in Tustin and an NCAA standout at the University of the Pacific in Stockton, CA. He was an assistant coach with the Silver Medal winning USA Olympic Water Polo Team in 2008 in Beijing. Ryan is now on the water polo staff at the Air Force Academy. Ryan’s son Reese took lessons at Blue Buoy before they moved to Colorado Springs. Chad Hundeby was inducted into the International Swimming Hall of Fame in May 2012 as one of the all-time great open water marathon swimmers. Chad learned at Blue Buoy in the early 1970’s and was a CIF champion in the 500 Yd. Freestyle for Woodbridge H. S. of Irvine. He followed Amy White’s lead and swam for Southern Methodist before discovering his love and tenacious drive to compete in long distance open water swims his list of accomplishments is amazing including his breaking and then holding the World Record for the English Channel Crossing for over eleven years. Chad’s sons, Anders & Hayden took lessons at Blue Buoy and now swim for the Irvine Novaquatics. Jessica Hardy learned at Blue Buoy as a three year old and is a strong candidate to make the 2012 U.S. Olympic Team. She was a National H.S. Record holder in the 100Yd Breaststroke at Long Beach Wilson H.S. & competed at U.C. Berkeley. She has set the American Record in the 50M Freestyle and held World Records in the Breaststroke. MaKenzie Fischer learned at Blue Buoy and discovered her love of water polo and was a 2 time CIF Player of the Year at Laguna Beach H.S. and is now at Stanford after her Olympic experience. Aria Fischer is following her sister as an elite water polo player. She learned her swimming skills at Blue Buoy and played with her sister at Laguna Beach H.S. also earning a CIF Player of the Year award following her Olympic Gold Medal experience. She will join her sister at Stanford. 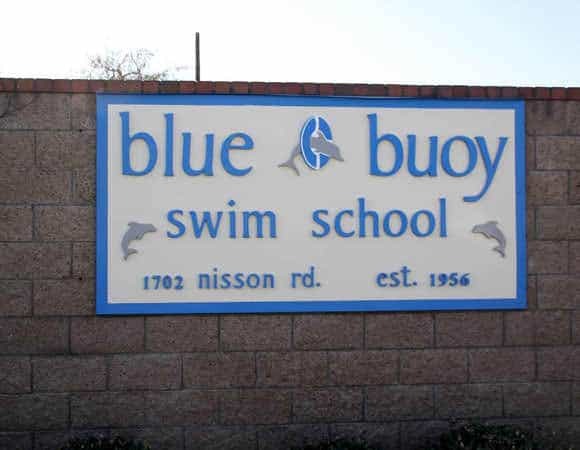 When did you swim at Blue Buoy Swim School?